The Sobbing School, Joshua Bennett’s mesmerizing debut collection of poetry, presents songs for the living and the dead that destabilize and de-familiarize representations of black history and contemporary black experience. What animates these poems is a desire to assert life, and interiority, where there is said to be none. Figures as widely divergent as Bobby Brown, Martin Heidegger, and the 19th-century performance artist Henry Box Brown, as well as Bennett’s own family and childhood best friends, appear and are placed in conversation in order to show that there is always a world beyond what we are socialized to see value in, always alternative ways of thinking about relation that explode easy binaries. Joshua Bennett received his PhD in English from Princeton University. He is currently a member of the Society of Fellows at Harvard Univeristy, and has received fellowships from the Callaloo Creative Writing Workshop, the Hurston/Wright Foundation, and the Ford Foundation. His poems have been published or are forthcoming in Beloit Poetry Journal, Callaloo, the Kenyon Review, and New England Review. Bennett tours nationally and internationally as a performance poet and has recited his original work at the Sundance Film Festival, the NAACP Image Awards, and President Obama’s Evening of Poetry and Music at the White House. He lives in Yonkers, New York. "At a moment in American culture punctuated to a heartbreaking degree by acts of hatred, violence and disregard, I can think of nothing we need to ponder and to sing of more than our shared grief and our capacity not just for empathy but genuine love. Poetry is critical to such an endeavor—and Joshua Bennett’s astounding, dolorous, rejoicing voice is indispensable." "At the heart of Joshua Bennett’s debut collection lies grief, but his poems also pay tribute to the human will to endure. There are glimpses here of James Baldwin and Zora Neale Hurston where Bennett’s syntactical dexterity and feeling for language meet the rhythm and flow of dangerous music. His poems of identity are also poems of imagery and invention, and they testify to poetry’s endless mutability through story and song, lament and praise. 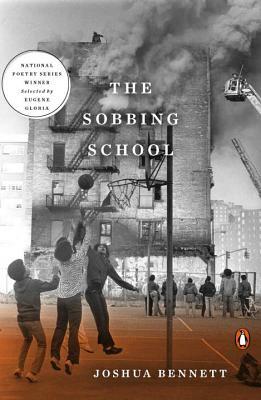 The Sobbing School is an essential book for our times."